Valtteri Bottas converted his pole position into a race victory relatively comfortably, in a final race of the season that was resoundedly disliked as being dull by almost everyone. 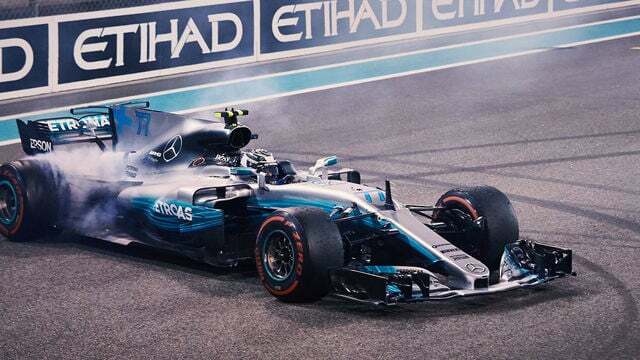 Lewis Hamilton, who finished second so obviously has some grounds for dissatisfaction, said of Yas Marina: "It's a great, great track but unfortunately it doesn't suit the cars very well." There was disappointment for Red Bull, as Daniel Ricciardo failed to see the chequered flag, retiring from fourth place with a hydraulic issue. Toro Rosso were also left dejected after losing sixth place in the championship to Renault at the final hurdle - Carlos Sainz retired from the race, but Nico Hülkenberg did just enough in sixth place to help his team beat their rivals. Felipe Massa finished tenth, picking up a final point on his final race, and he celebrated the result by completing so many donuts on the track that the car disappeared. In the end, though, it was Bottas, Hamilton and Vettel that took to the podium to spray the final champagne of the season.